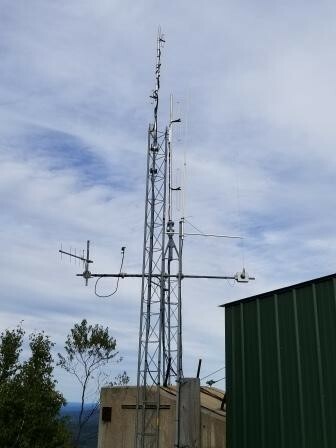 As of: Sept 22, 2018, we are "On The Air"
Back a few months ago now, sometime in the Spring of 2018, conversations started with Southwest Fire Mutual Aid about the possibility of a UHF DMR repeater on the summit of Crotched Mtn in the Bennington/Francestown area of New Hampshire. There had been a UHF repeater up there before for quite a while, but it had since been taken off the air. Knowing what kind of coverage that repeater had, I was certain that a DMR repeater up there could fill an incredible void between Keene and Concord. The only unknown at that time was internet access, as there currently wasn't any internet at all. I got the "go ahead" so at this point, we were off and running. Now to get equipment assembled. I had pretty much everything except the repeater itself. I had mentioned this site possibility to Bill, NE1B and shortly after that, the NEDECN fund drive began. The brand new Motorola SLR5700 was ordered soon after that with the goal of a September install target. Now I just had to work out the logistics with Cindy, N1NCI to get up there and figure out how to install the antenna on the very limited space I was going to have to work with. Mutual Aid had a very small tower up there for their equipment, but that was basically a tower top section bolted to the cement block that used to be part of one of the old ski lifts for Crotched Mtn. At least I think that's what it was. Anyway, we couldn't mount anything to the actual buildings so I had to get creative about how this was going to work. I had heard that Mutual Aid was going to construct a new tower to get them above the adjacent chair lift, but there was no timeline for that, however, I just happened to have a couple sections of Rohn 25 that I could donate to the cause that would possibly help them, and provide a structure for me as well. I devised a plan of attack to mount that tower to the side of that huge cement block, but it would require some drilling into cement, which I had never done before, and I had to come up with a mounting scheme. A trip to Home Depot and some superstrut metel framing channel seemed like it might work. A few cement anchors and clamps for the channel bracket and we should be good to go. The other option was to mount a tower base plate to another cement base for something else related to the old ski lift, but that was about 7 feet lower than the other block and I didn't want to loose that height. A potential frequency pair had been coordinated by now and the duplexers I had were re-tuned. 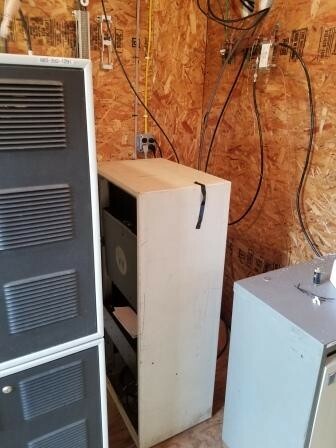 I had a DB408 that would work nicely up there and I also hollowed out a 5 foot Micor cabinet for the repeater. 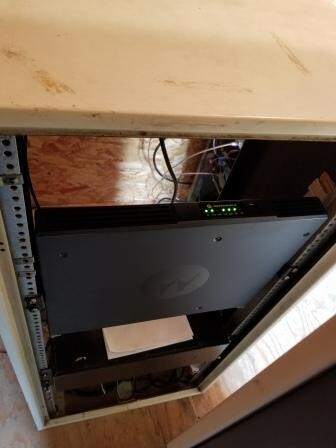 The 5700 was too deep to fit horizontally in the Micor cabinet, but the brackets for the repeater could be assembled to facilitate wall mounting, so I ended up rack mounting it vertically. Worked perfectly! So, back to the story... After getting all the pieces assembled and ready to go, a trip was planned for Saturday, Sept 22, 2018. The weather was predicted to be very nice, with clear skies, nice temps and no humidity. 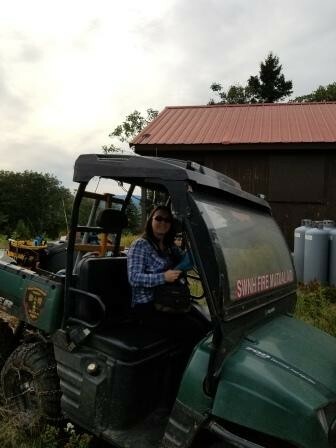 So, when the day came, Cindy arrived, and she, Brigette and I loaded up all the stuff and headed out from Keene to the summit. We arrived at the parking lot for the ski area and moved stuff from the truck to the OHRV utility vehicle and began our trip up. We even made a little time for some site seeing and photographs. Once we got to the top, I had to chuckle a bit at the name of the ski lift... But the view from it was beautiful! Brigette making a few adjustments to her camera. She gets the photo credits for this project!! Now the fun begins, unloading from utility vehicle, assembling the tower, and well... getting stuff done! Hey Cindy, how about we turn the OHRV around so we don't have to carry that cabinet so far? Cindy checking to see if we have any kind of internet connectivity. We do, it's not exactly a rock crushing signal, but it'll have to do for now. Time to start drilling that cement block. Cindy was incredible! I called her a beast! I tried a couple holes, but holy crap, I thought it was going to rattle my teeth out. I could never do that for a living. Damn.... But after all was done, we got the strut mounted and it was even level!! Okay, the tower mounts are done and now time to raise the tower. By now we've been working several hours and fortunately a nice hiker saw us walking it up and offered an extra set of hands. Thank You mystery hiker!! Greatly appreciated!! And look at that, it's even plumb! This is the current "MD380 code plug" for an MD380 HT, as well as "CS800 code plug" for a CS-800 Mobile. Feel free to edit as you see fit, but it'll at least get you started. It also contains most contacts for NH, VT, ME & MA.